There is a popular belief that bujutsu (martial and/or military art science) is the self-protection means, while budo (a war or a way of a warrior) is studied to get sophisticated. This is absolutely wrong. It’s rather more appropriate to say that bujutsu is studied but budo is followed. “ryu” — tendency (style) in art (martial arts) or religion. The term “jutsu” accents rather the technical performance and it does not mean at all that jutsu art is only aimed to the physical education. Terms “do” and “ho” (either “po”) stand for the philosophy when art is life style. Nin-jutsu is consequently the “art of ninja” while nin-po means “ninja skills». Ninpo is the martial arts techniques developed in Japan for ninja to study throughout their lives. 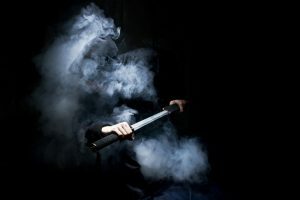 Unlike ninjutsu (martial traditions mastered) ninpo is the art that is incomprehensible; this is the true path of ninja.